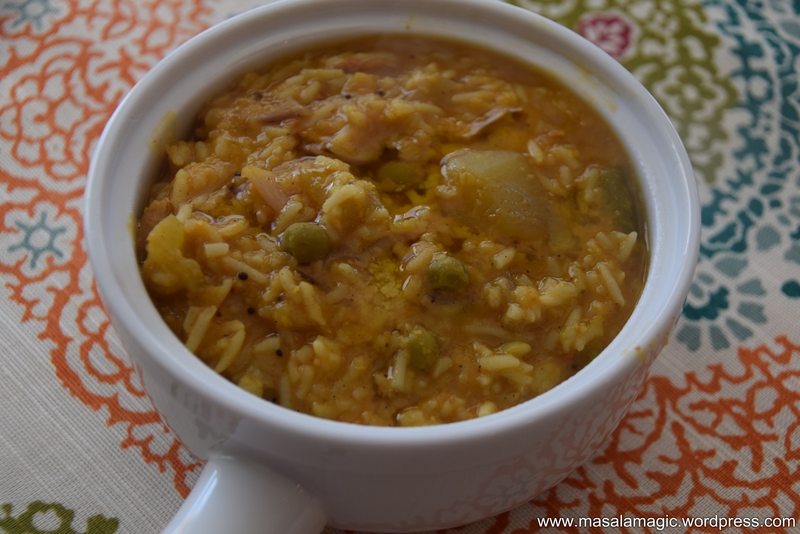 Bisi Bele Bhaat (BBB) is a traditional Karnataka dish. 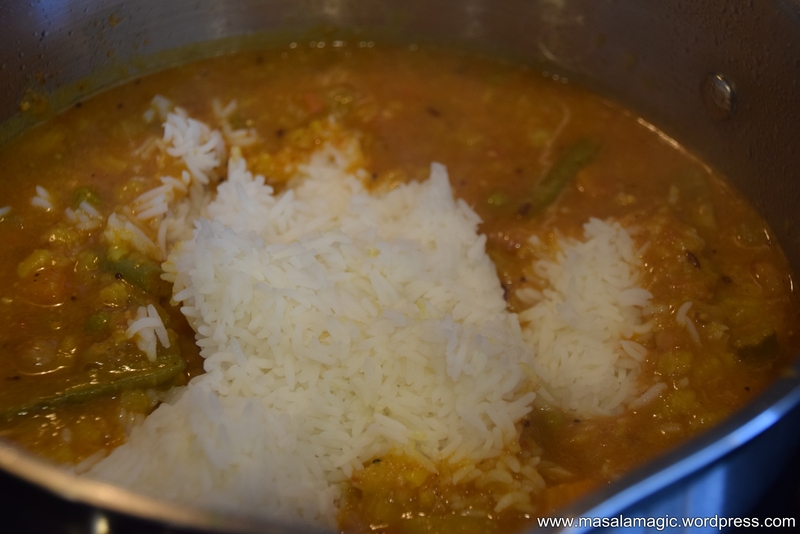 “Bisi” in Kannada mean Hot, “Bele” means Dal or Lentils and “Bhaat” mean rice. 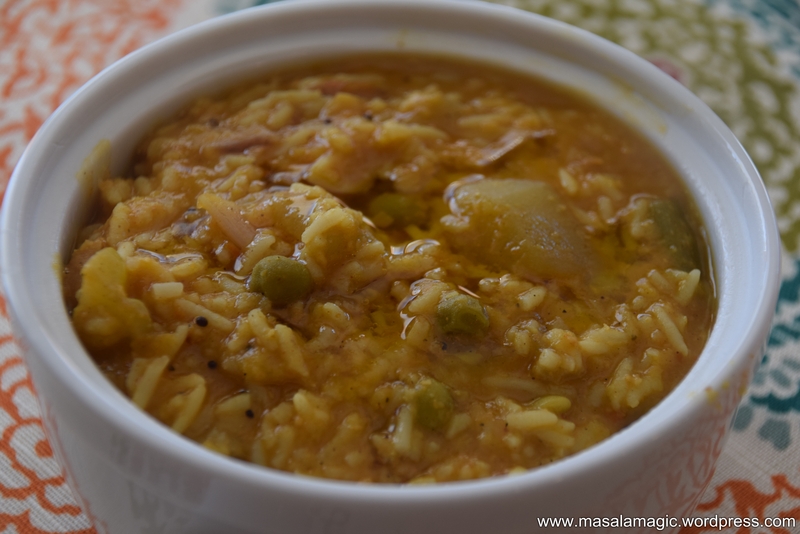 So this name literally translates to Hot Dal Rice 🙂 And true to its name, this delicious dish is very hot, spicy and a combination of dal, rice and vegetables. 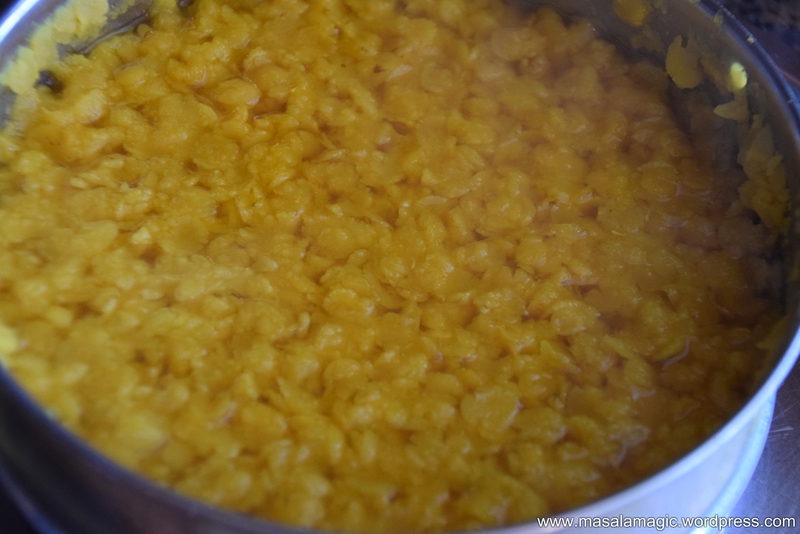 The recipe itself seems tedious, but once you have some of the basics it is a very quick recipe to put together. I love making it in a large batch because this is a crowd pleaser and you can actually not make it in small quantities. Even the smallest measure will give you a recipe that can at least feed 5 people!! I am posting this recipe because this is the most asked for or sought after recipe from most of my friends. And also I see that people typically search for this recipe a lot online! The key ingredient for this recipe is the BBB powder. I make my own at home in small batches. The store bought varieties don’t even come close. So if you are making BBB with a store bought powder then do not read any further 🙂 ’cause i guarantee you, no matter what you do it will not taste authentic 🙂 That said, this powder can be made ahead of time and stored to be made whenever you desire to make BBB. 1. When roasting ensure that you are roasting on medium heat with constant monitoring and stirring in between. All dals need to be golden brown and not burnt. 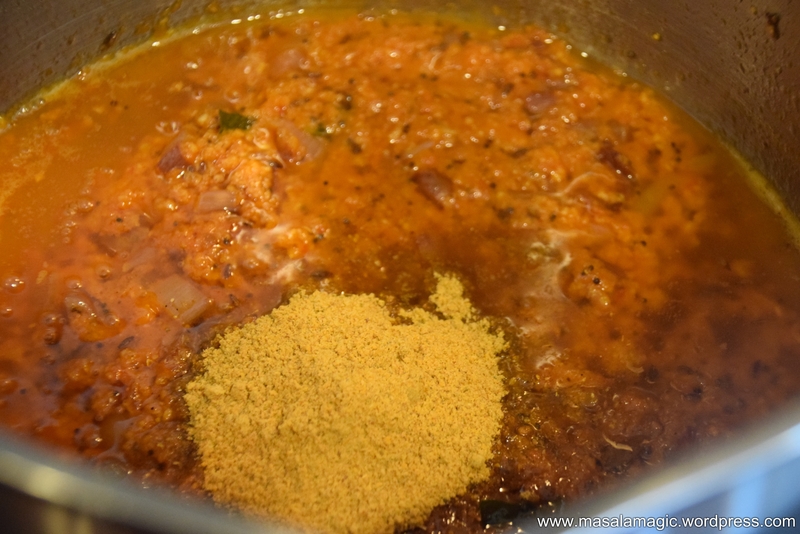 Burnt dal will change the flavor of the powder. 2. Roast Group 1 without oil. 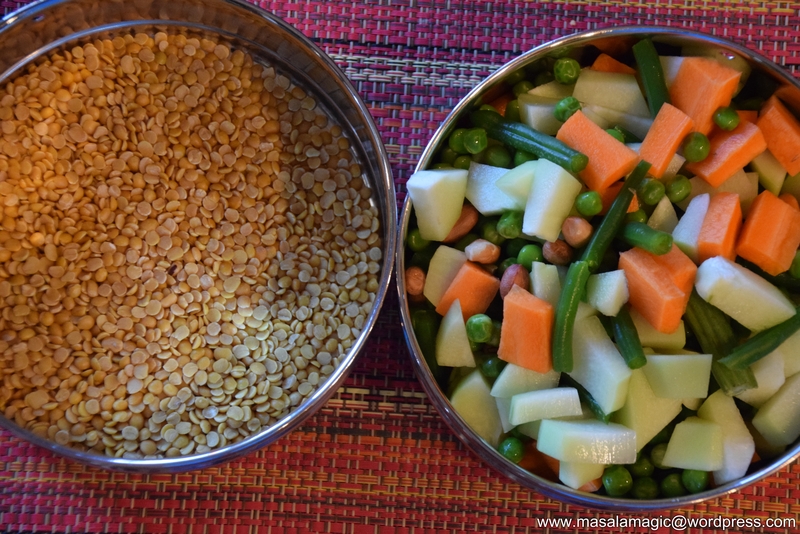 Roast each ingredient separately since urad dal roasts a little faster then channa dal. 3. Roast Group 2 with a little oil. All together. 4. Roast Group 3 with a little ghee. 5. Combine all and cool. 6. 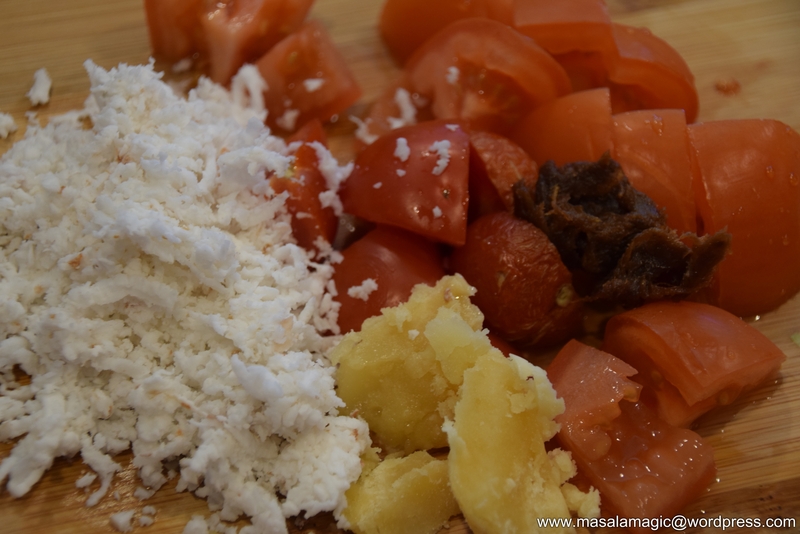 In a Mixer or food processor combine all and grind to a smooth powder. 1. 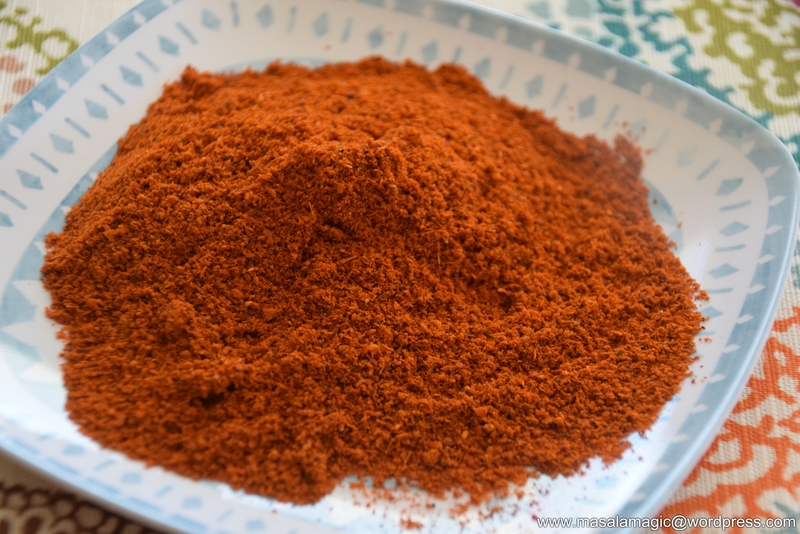 Make the Bisi Bele Bhaat powder as mentioned above. 2. Grind all the ingredients mentioned in “to be ground into coarse paste” above. 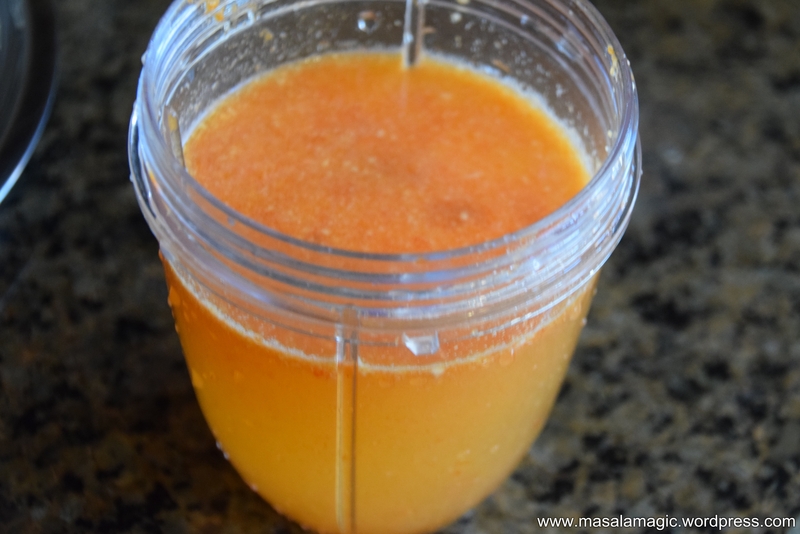 When you grind the paste, rinse the insides of the food processor or mixer jar and save the water. 3. 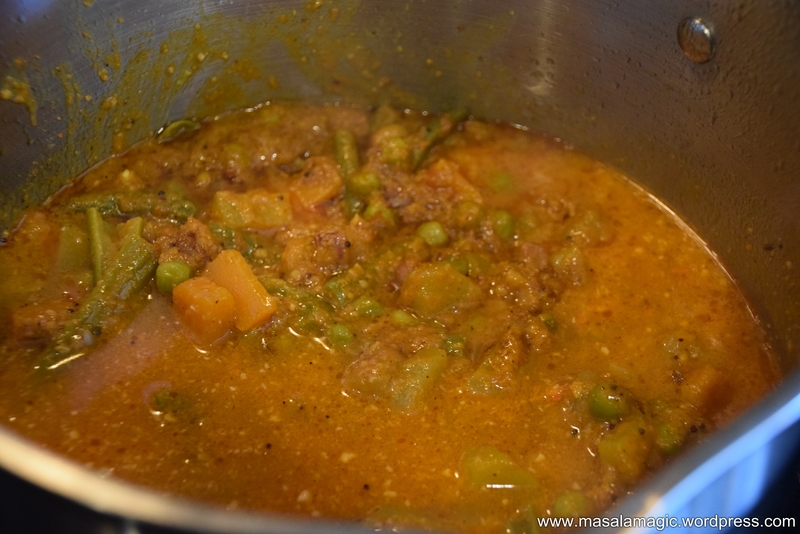 Boil the veggies and dal in a pressure cooker with enough water and a pinch of turmeric powder for about 3 whistles and keep aside. 4. Cook the rice in an electric cooker or pressure cooker. I use the ratio 1 cup : 2.5 cups Rice. Keep aside. 5. 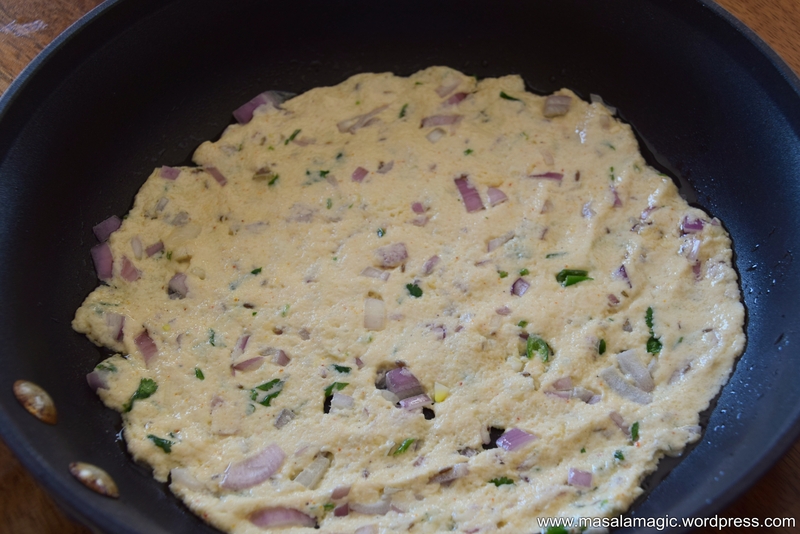 In a heavy bottomed pan, heat the oil and ghee. 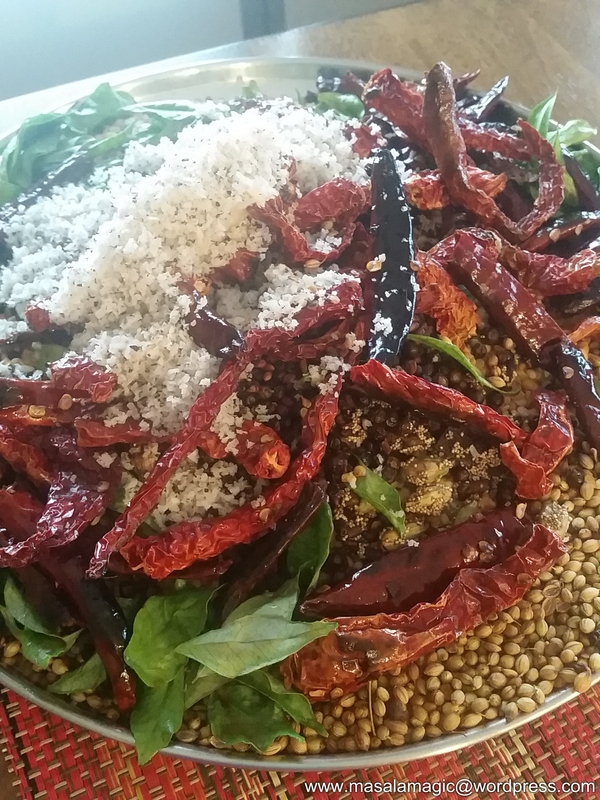 Add hing/asafoetida, mustard seeds and cumin seeds. 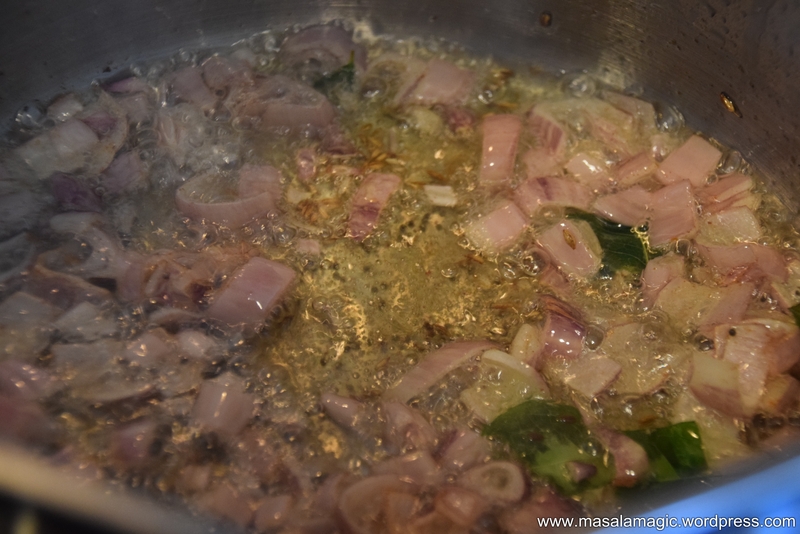 Allow the mustard seeds to splutter and then add the curry leaves and onions and fry well. 6. 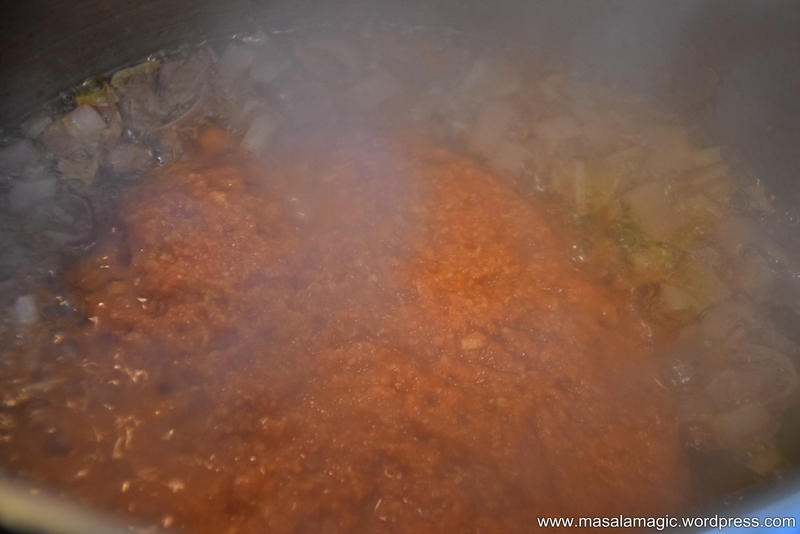 After the onions are golden brown, add the ground tomato paste and mix well. Fry until the oil leaves the sides. 7. 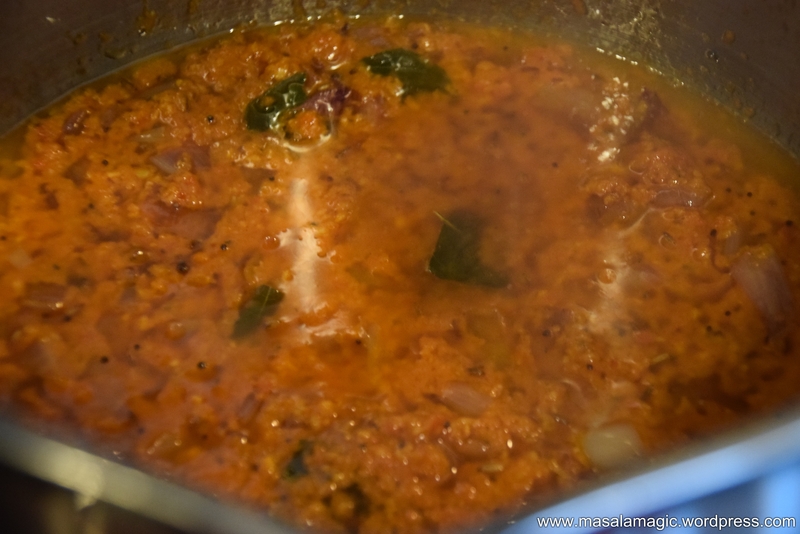 Then add 2 tsp of the Bisi Bele Bhaat powder and mix well. 8. 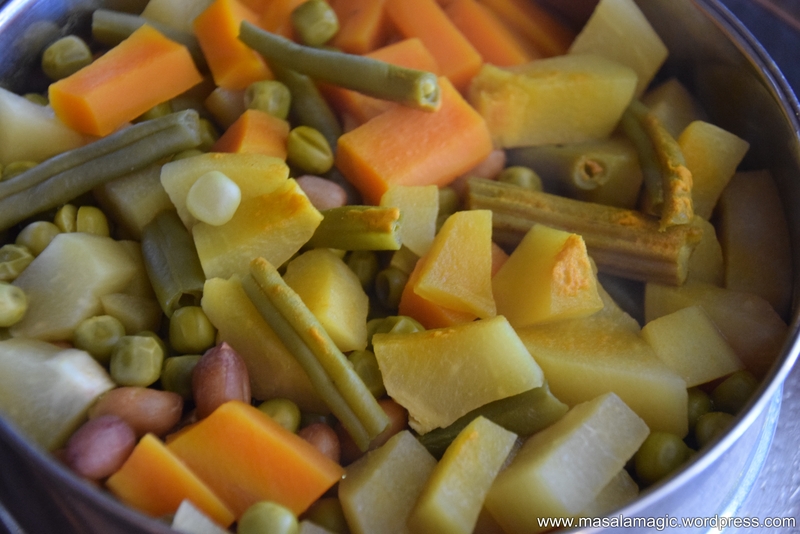 Then add the boiled veggies and salt and mix well. Saute for about 5 minutes until well blended. 10. Mix well. 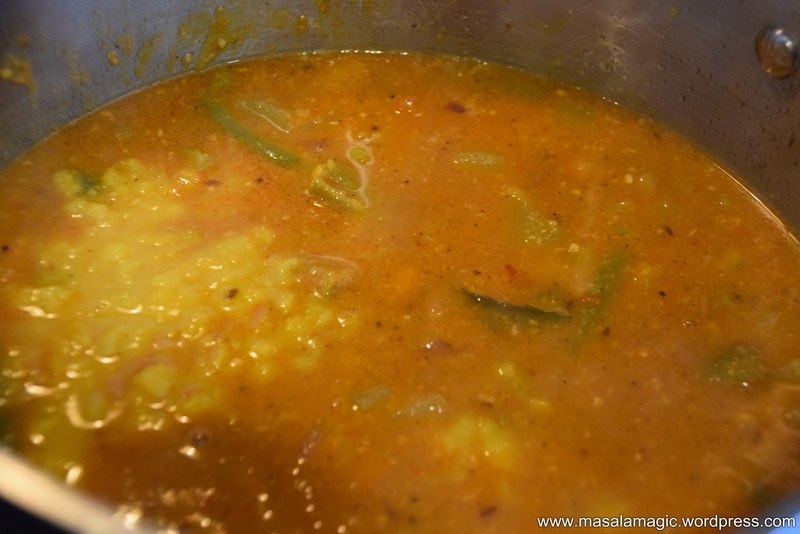 Add the boiled dal first and then the cooked rice and mix well. 11. 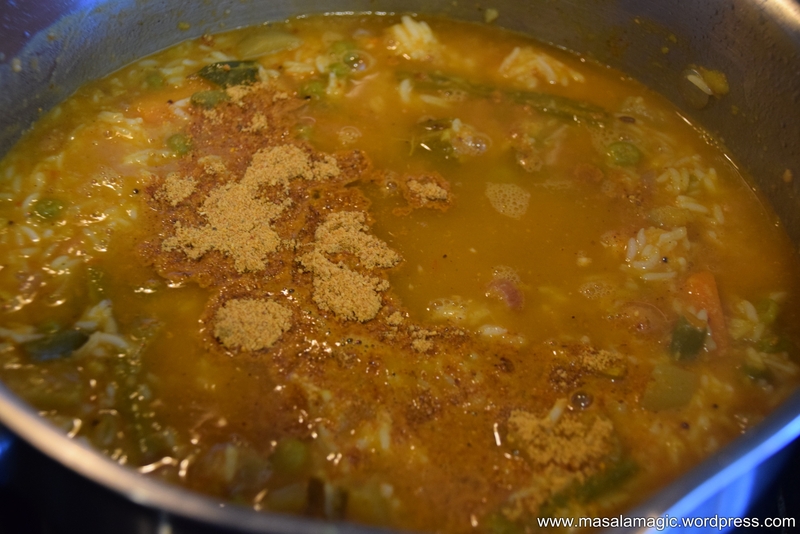 Add about 5 tsp of Bisi Bele Bhaat powder and any additional salt if needed and mix well. 12. Cover with a lid and allow to cook for about 10 minutes on low heat until it all comes together. 12. Serve hot topped with ghee. You may even fry some whole cashews in ghee and top on the bisi bele bhaat. 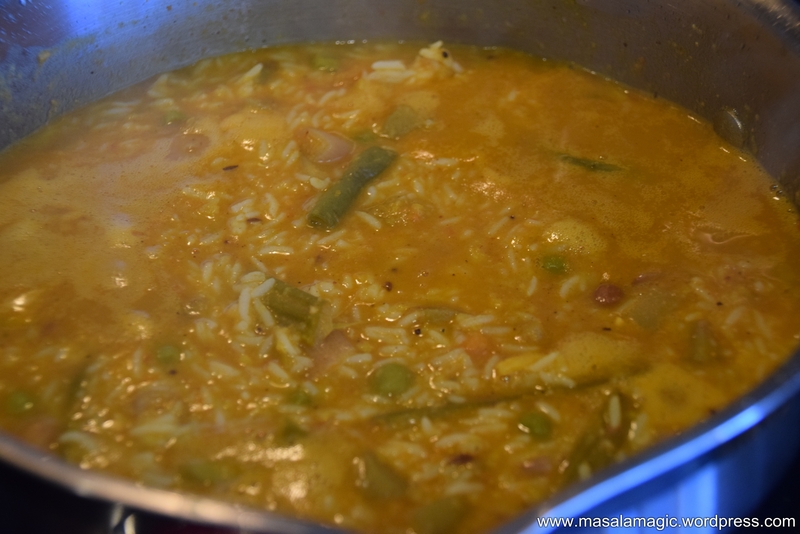 Delicious and Hot Bisi Bele Bhaat ready to be served!! Typically Bisi Bele Bhaat is served with spicy boondi or Potato Chips. Serve hot and enjoy!! 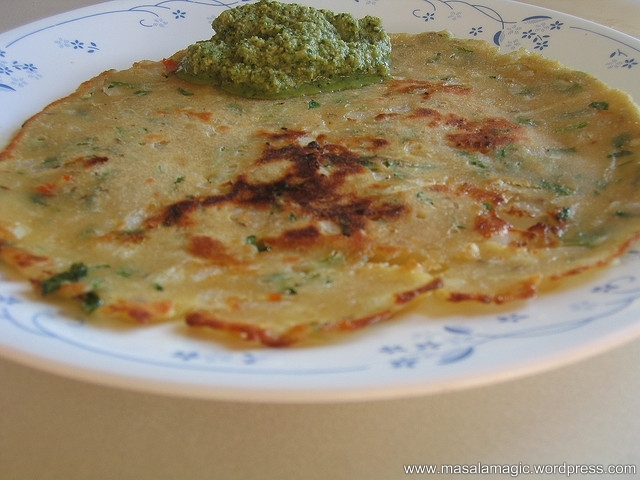 Roti or Rotti to be more precise – pronounced with a stress on the “ti” is traditional Karnataka fare. 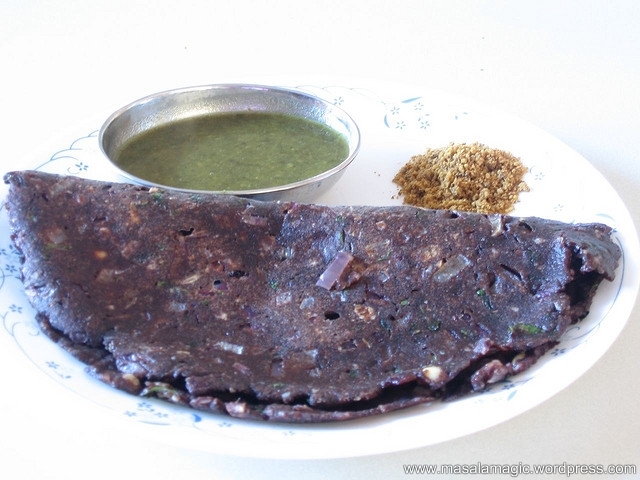 Typically eaten for breakfast the popular Rotti varieties are Ragi Roti (Finger Millet Flour Rotti) , Akki Roti (Rice Flour Rotti) and Jolada Roti (Sorghum Flour Rotti). 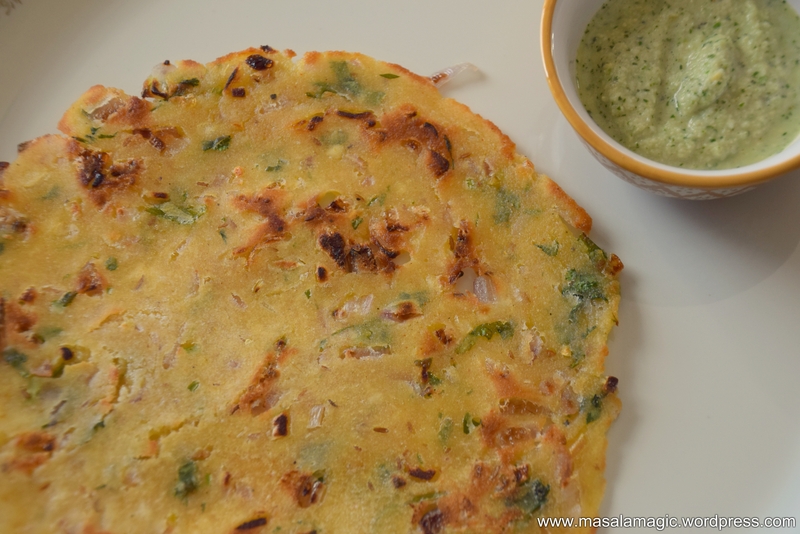 Very close to the Maharastrian Thalipeeth, this breakfast dish is lip smacking good. 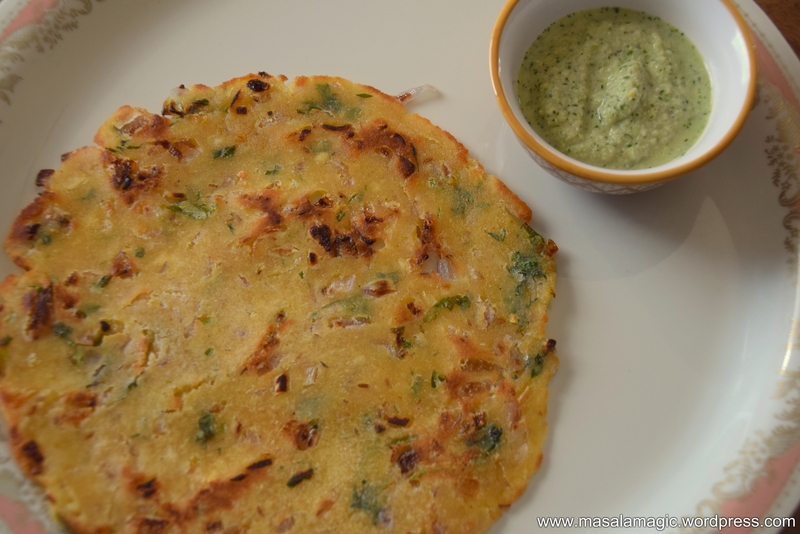 The thinner you make it, the tastier it is.. and serve it with any chutney or gravy on the side. In North Karnataka, roti is usually served with Eggplant/Brinjal Curry (called Badnekayi Palya) and Green Moong Curry (also called Usli). The whole thing really comes with this combination!! 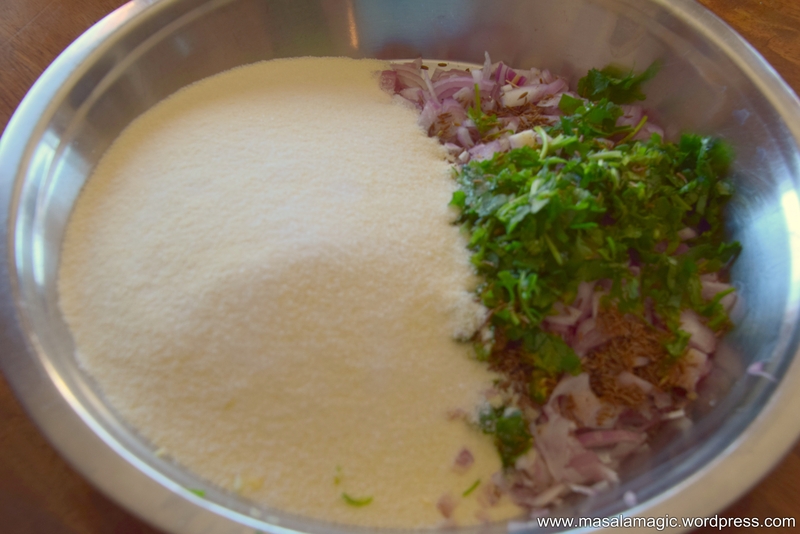 Combine all ingredients except the Rava/Suji and let sit for 5 minutes. 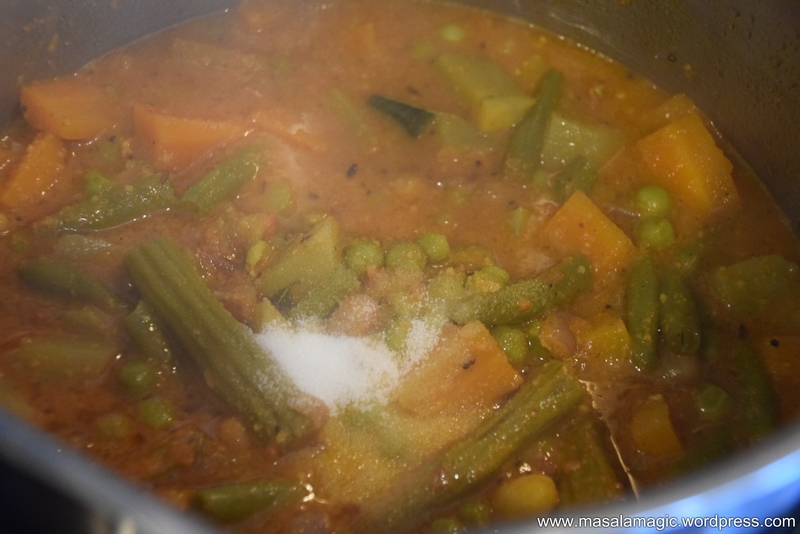 Add the rava and mix well into a thick dough with water. The dough should be soft and pliable. Take a large golf ball sized dough and pat flat on a greased griddle or tava much like below. The thinner the better. 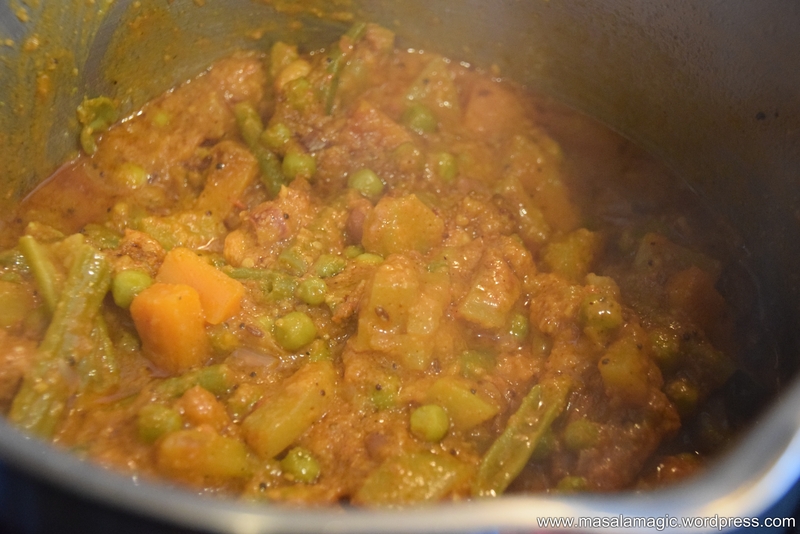 Cover with a lid and cook on stove top on medium heat for 4 to 5 minutes. Open the lid and cook until golden brown. Turn over for a minute or two. Serve hot with a side of your choice.